If you cook during the holidays for your family or guests, you know that this season can wreak havoc on your kitchen. Simply cooking regular meals to feed yourself and your family can be challenging enough during the busy holiday season, let alone preparing potluck dishes, baking holiday cookies, or hosting a family meal. You can make things run more smoothly by organizing everything from your meal plan to your storage space in a way that allows you to streamline your cooking projects. Here are 5 tips to help you organize your holiday kitchen. When you have a lot of cooking to do over the holidays, it helps to sit down and plan out your meals well in advance. This enables you to plan meals that use similar ingredients so you can buy in bulk and use everything that you buy. It also allows you to prep some things ahead of time, such as cookie dough. Another trick is to make family meals ahead of time and freeze them to simplify dinner time on days when everyone is busy or you’re burned out from cooking. Baskets are great for organizing everything from your pantry to your fridge. Group similar items in baskets to make it quick and easy to find what you’re looking for, especially when you’re strapped for time during holiday meal prep. Fridge baskets should be clear plastic to help you see what’s inside and to make cleanup easier in case of a spill. Look for baskets with handles that can be used like drawers. In your pantry, choose decorative woven baskets with square sides to maximize your storage space, and labels to help you quickly find what you’re looking for. Kitchens are often short on storage space so find creative ways to make the most of what you’ve got. For example, storing dry goods in glass canisters makes for an attractive display on counters or open shelving. Flat items such as baking sheets and cutting boards should be stored vertically to maximize space and make it easier to find what you need when you’re preparing a meal. To keep them from falling, install three or four tension rods vertically to make a “wall” that will brace the baking sheets and cutting boards. 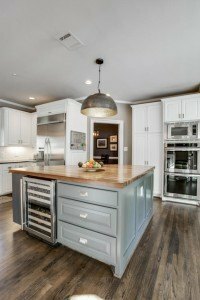 Create a unique kitchen island with contrasting paint and a butcher block top. Having a kitchen island gives you more storage and prep space. You can have an island built to blend with your existing cabinetry, or use a piece of antique furniture with a butcher block to create something one-of-a-kind. Make it a functional showpiece by painting it an accent color to contrast with the rest of your cabinets. No kitchen can maintain its organization if you don’t keep it clean. During the holidays especially, clean up as soon as possible after dirtying the kitchen. Even if it’s late at night and you’d rather go straight to bed, you’ll appreciate walking into a clean kitchen in the morning. Once you’ve organized the kitchen it also helps if you keep everything put away when not in use so everything is easy to find when you need it. The thought of cooking during a busy holiday season, whether it’s for one person or twenty, can be intimidating. Be well prepared and you can get the most out of it. If you start planning menus and getting your kitchen in order now, you’ll be ready when the activity hits! 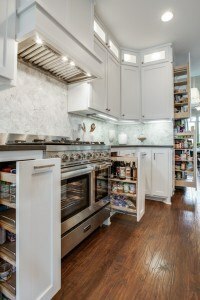 DFW Improved can customize your kitchen to turn it into your dream space. Contact us today to start planning your remodel.